If I could eat like this every night, I think I might. Indonesian cuisine has everything I love in food: fresh, crisp vegetables, color, heat, spice and just the right amount of sweetness combined to produce a satisfying yet light meal. Plus, regardless of the presentation, everything always looks spectacular. And, there's nothing fussy about the preparation. A little chopping, a little mashing/grinding with a mortar and pestle, a quick stir fry or simmer and you've got yourself a beautiful meal. 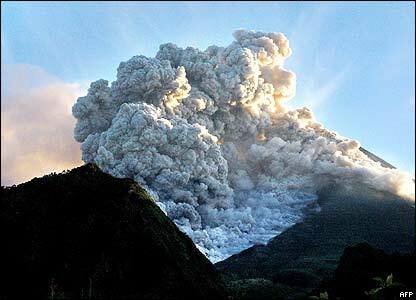 For anyone who's been paying attention to the news, Mount Merapi erupted Thursday night, covering villages within 10 miles of its proximity in ash, killing and devastating villagers in it's wake. It seems like a little bit of a disconnect to be tossing off a breezy blog entry about Indonesian cooking when people in that country are likely going without food tonight...on the other hand, were it not for this project, I wonder if I'd even be paying attention to the sound bites of news we here in the US get. My heart goes out to Indonesians everywhere. the Javanese being the predominate ethnic group. 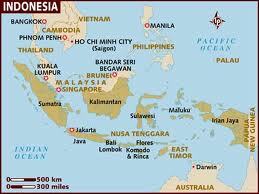 Equally diverse, Indonesia's cuisine varies greatly by region and cultural traditions and influence. India, the Middle East, China and Europe as well as the Dutch who colonized the archipelago have all contributed their culinary traditions to this beautiful country. It is customary for Indonesians to eat holding a spoon in their right hand and a fork in the left, or to use their hands. Chopsticks are mostly used in food stalls or in regions influenced by Chinese cuisine. The combination of shallots, garlic, hot peppers and crushed tomatoes are mashed and ground in a mortar and pestle to create a hot and delicious base for the stir fry. The Indonesian archipelago Maluku Islands, are frequently referred to as the "spice islands" and are known for growing and harvesting mace and nutmeg. Add tomato and daun salam leaves and fry for 5 minutes, mashing the tomato into pulp. Add stock, bring to boil. Add eggplant to pan and simmer for 10-15 minutes or until just tender. Add shrimp - but do not over cook. Add coconut milk, sugar and salt and stir while heating through. Heat oil and saute ground spices. Add chives and green beans. Add shrimp, taking care not to over cook. Add lime juice before removing from heat. Serve hot with noodles or curry.